Earlier this week I was disappointed to see a house in the village with a whole bunch of helium balloons bobbing outside – disappointed, because it would have been an excellent thing to introduce Marty to. But by the time I came through, it was growing late and would have been too dark to take him down the lane. Boo. Luckily, the Gods of Desensitisation saw me in my time of need and blessed me with other opportunities. 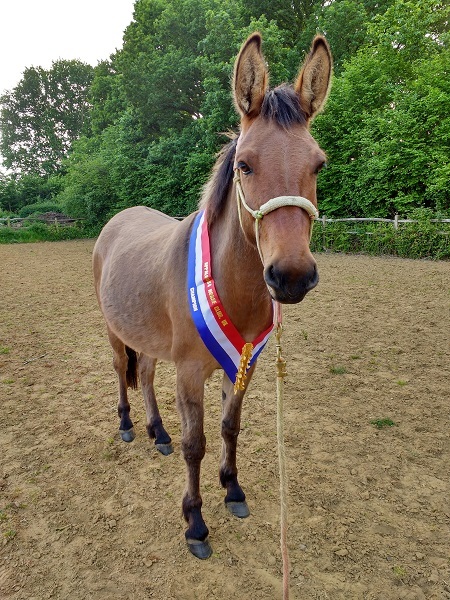 For example, Marty won the Overall Champion of Champions title (I’m going to keep saying that because it sounds great) in the Happy Horse Photo Show, which meant that they sent him an Overall Champion of Champions sash! We’re champions. Of champions. It’s awesome. Anyway, it obviously meant that I had to get some pictures with him wearing it, so that was a good session to have. Yes, alright, it had a velcro bit at the back so I didn’t have to try and put it over his ears; but it was still a different type of material for him, and considering I’ve never really used velcro around him he was a good boy to let me put it on and off. Here is Marty, the Champion of Champions, wearing his Champion of Champions sash. We keep our horses on DIY livery, and the family who own the land were playing a game of cricket in their garden one evening. The garden backs on to the stable yard, so Marty got to experience people running about, lots of good-natured shouting, and applause. The applause is especially important because I assume he’ll encounter a lot of that in his future. 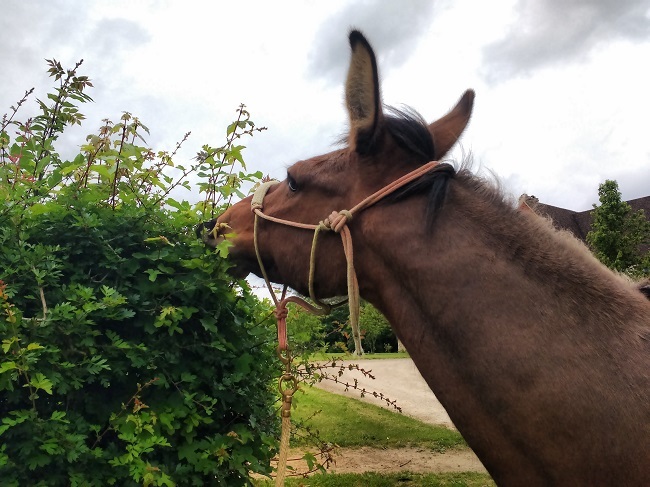 On Monday I hadn’t planned to do anything with him as my back was so bad, but when I arrived at the yard it was to find that one of the brick outbuildings was being knocked down – and I obviously couldn’t pass up a good opportunity like that! 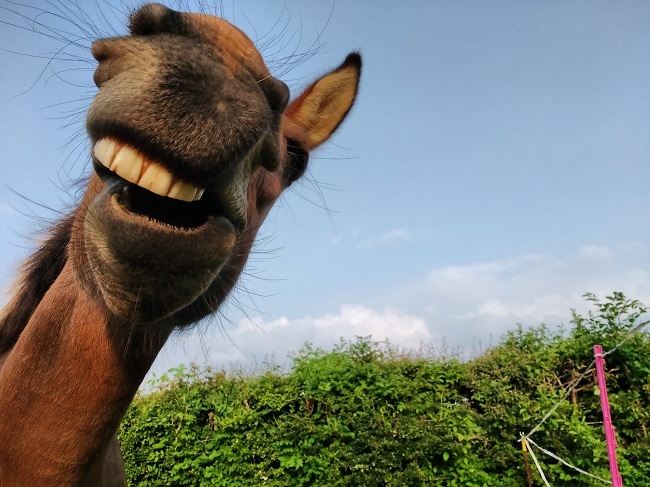 So Marty got to watch the excavator at work, goggle at some corrugated iron sheets (people carrying the sheets were even more alarming), observe the tractor ferrying things to and from the bonfire, and access the stable yard via the narrow, winding people path. 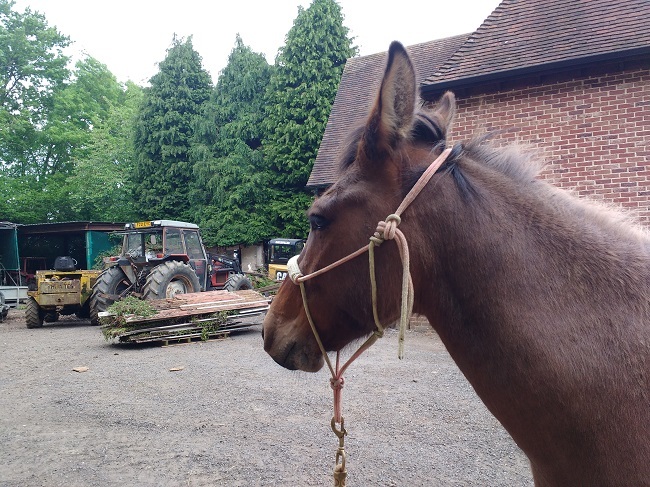 Tractors and machinery don’t normally feature on Marty’s fear-o-metre, but he was quite agitated before I took him out of the paddock and, as any equine owner knows, Things That Once Were But Are Now Different really freak out our long-and-short-eared friends. He did very well though, and only ‘misbehaved’ when he decided he just had to show me his rodeo bronc impression back at the field. I looked at him, he looked at me, and then we had a very polite collected trot instead.